Journey of Discovery/Land Rover MENA. In 1985, Li Hua visited a valley in the foothills of the Tibetan Plateau. The area was better known for its panda population, but the oenologist realized that its high altitude, hours of sunshine, sandy soil and low precipitation also offered ideal conditions for growing grapes. Li’s findings gave local authorities an idea, and over the past decade they have begun to implement an ambitious plan: to convert Xiaojin, a county in Aba prefecture, Sichuan province, into the Bordeaux of China. There are 1,000 hectares (2,500 acres) of vines in Aba, but in December the local government announced a project to plant 6,700 hectares by 2020. But as plans to enlarge the vineyards are drafted, conservationists are voicing concern. A recent reform in land tenure in the area, according to research published in the journal Science, could threaten the natural habitat of endangered species such as the giant panda, red panda, golden snub-nosed monkey and Thorold’s deer. The reform enables farming households to transfer the operation rights of their land to outside enterprises. This could allow logging companies or other industries, including wineries, access to 350,000 hectares of previously undisturbed forest, which represents about 15 percent of panda habitat. “Pandas are squished into the last little upland refuge that hasn’t been converted into agriculture,” says Lee Hannah, a senior scientist at Conservation International, a US-based NGO. “A species that has lost so much habitat can’t afford to lose more.” But Hannah, however, says that if vines are planted in areas already adapted for crops, the renewed threat to pandas will be minimal. China’s wine industry is young and holdings small by western standards. But it is consuming and producing wine in unprecedented volumes. Wine sales reached £27 billion last year, an increase of 20 percent on 2011, according to the research firm Euromonitor International. As the rising middle classes seek new gastronomic experience China has become a crucial market for global conglomerates. Last year imports accounted for 45 percent of wine sales. Increasingly, though, wines are being made in China. International Wine and Spirit Research predicts China will overtake Australia to become the world’s sixth largest wine producer by 2016. But just a handful of regions are suited to growing European-style grapes, and from these ever more is being demanded. On a sweltering day in the Xiaojin Valley, a dozen farmers shelter from the midday heat beneath some apple trees. The eaves of their houses are painted deep crimson with white circles — the typical style of this majority Tibetan region — while bright frescoes on doorways depict Buddhist prayer wheels and lotus flowers (in the last few years Aba has been at the centre of a wave of self-immolations by mostly Tibetan monks protesting against the exile of the Dalai Lama and Chinese government rule). Aba is a mountainous region and fertile land is scarce. While farmers have made a living growing cash crops such as corn and potatoes for centuries, today a stack of concrete posts, soon to form trellises, obstructs a village road. One farmer, Huang Nonghai, saws a metal rod to help erect a vineyard fence. Last spring, he and his fellow villagers signed over their land to Jiuzhaigou Natural Wine Industry Company in a 20-year contract. They are optimistic: “We hope the company will help our village earn more, so we can all share the profits brought by the developing wine industry,” Huang said. Founded in 2001, the firm is the sole wine producer in Xiaojin. From its Tibetan-style chateau headquarters it produces eight wines, ranging from a £10 merlot to a £240 cabernet sauvignon. The majority of cases are sold to officials for gift giving or to drink at banquets. In order to expand current operations Jiuzhaigou needs more apple farmers to switch to grapes. It sometimes meets resistance. “But their land is state-owned, not their own,” said Zhang, adding that the Xiaojin government intends to steer the region’s agricultural output away from crops such as corn. “Our vineyards make more profit,” he said. Twelve years ago, when Jiuzhaigou was first established, Wu Qiyun and his wife converted their modest one-acre orchard into a vineyard. “We expected the vineyard to bring more income,” he said as he headed towards his vines with a plastic container of pesticide strapped to his back. “But the prices for apples rose over the last decade, so growing grapes is actually not as good.” Last year, the couple made 20,000 yuan from the vineyard. If they still had apple trees they could have earned twice that. It has been a struggle for Wu to support his two children. 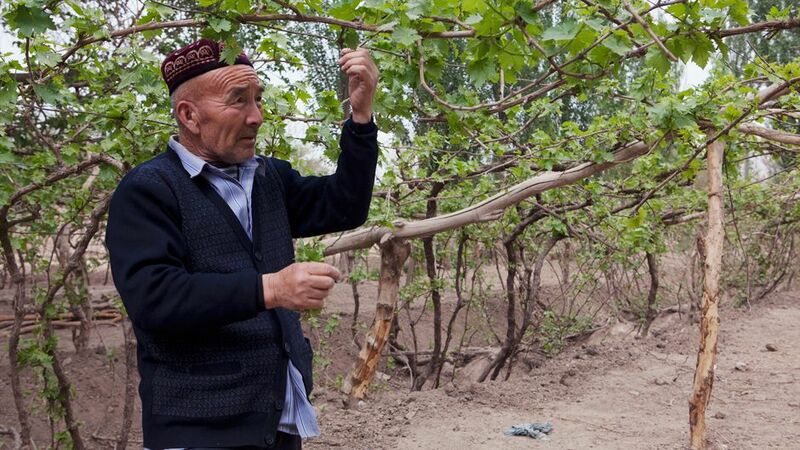 Last year, in protest over the low price Jiuzhaigou offered for grapes, farmers began selling their harvest to a producer in a neighbouring county. Eventually authorities intervened, forcing Jiuzhaigou to raise the buying price to three yuan per 0.5 kilogram. This article appeared on guardian.co.uk, on 26 July 2013. Nicola Davison is a freelance journalist based in Shanghai. She writes about current affairs, the arts and especially about China.